T-Shirts are great to work in, providing flexibility in both product choice and logo application ensuring that your logo is displayed in the best way possible making a great first impression on your customers. 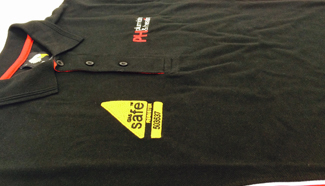 APS offer a huge range of colours and styles of T-Shirt to meet practically every need, budget and company image. Your logo is applied in a number of ways; embroidered, heat seal, screen, or digital print. We also supply Exhibition and promo T-shirts which are usually screen printed. This is a bulk printing process that allows for large quantities of identical T-Shirts-shirts to be produced with very low unit costs. With a large variety of T-Shirts-shirts available we can advise on the best product to suit the occasion and APS will also help with your logo design if you don't have one.